The Fidel Castro Tapes re-aired Tuesday, November 17, 2015. Survey the turbulent career of one of the world’s most contentious leaders. The Fidel Castro Tapes features rarely — and never-before-seen — images to tell the life story of the controversial leader of Cuba. To some an icon of resistance and to others the very face of dictatorial oppression, Fidel Castro was one of the most provocative political figures of the 20th century. The Fidel Castro Tapes chronicles how his drive and charisma catapulted him to power in Cuba and how he used these traits to maintain control of his country for nearly five decades and capture the attention of the world. 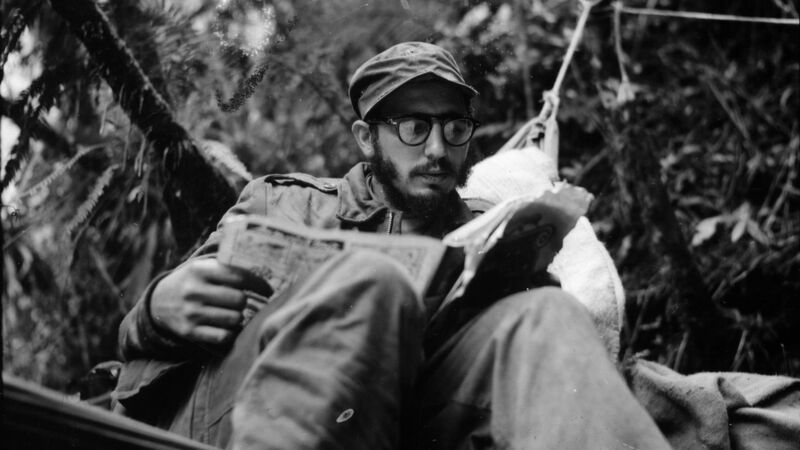 Instead of telling his story through interviews, the program relies solely on media reports, rare images and recordings to document Castro’s turbulent life. In addition, the program features footage obtained from several Cuban archives. By using an “in the moment” style of storytelling, The Fidel Castro Tapes gives viewers a sense of being present during the most significant moments of Castro’s career — and gives remarkable insight into his personality. The film details how Castro gained control of his island nation and how he tried — and failed — to win the friendship of the United States, showing why relations with the U.S. deteriorated as it became obvious that many members of Castro’s ruling party were Communist. Because of the Communist threat, the U.S. banned importation of Cuban sugar — the main economic engine in Cuba. In response, Castro seized all American-held businesses in his country, including sugar plantations, and, as a result, the U.S. issued an embargo on all Cuban goods, an embargo still in force today. From the failed U.S.-backed invasion of Cuba at the Bay of Pigs and the tense stand-off of the Cuban Missile Crisis, to the collapse of the Soviet Union and the financial destruction that came with it, the film examines Castro’s tumultuous career and his resilient hold on power. The Fidel Castro Tapes also covers watershed events in Castro’s career such as the Mariel Boatlift, the downing of two U.S. civilian planes, and the custody battle between Castro and the United States over the fate of six-year-old Cuban refugee Elian Gonzalez. Finally, the program follows Castro’s declining health, his decision to cede power to his brother, Raul, and Raul’s efforts to continue Fidel’s legacy. The film shows that even though Castro is now out of the public eye, he remains the most prominent figure in Cuba’s history. The Fidel Castro Tapes brings to life, in vivid detail, the career of a man who is at once described as both a pariah and a legend. The Fidel Castro Tapes was produced and directed by Tom Jennings.